I like to ask people questions that, perhaps, no one has ever asked them before, or, at the very least, ask a question which tells me something that I don't know about them. It's a good game that allows you to know things about your friends that you might not otherwise ever know and can shed some interesting light on to their past or perspectives. Here's a question that I'm pretty sure I have never asked anyone, but these cookies brought to mind. The question is, "what was the first German word that you ever learned?" Of course, this only works if you are not actually German. If you are German, you probably don't remember your first German word. I asked my husband this question and he said his was "zugzwang". Her learned it when he was 12 or 13 from reading books on chess. See, you have already learned something about my husband from that strang question and answer. My sister said that hers was likely something heard on the old comedy, "Hogan's Heroes" and she guesses it might be "schnell." This tells you something about what she watched on T.V. as a child (re-runs of shows that thought being a prisoner of the Nazis was a great sitcom idea). I asked my friends on Facebook and they gave an obvious one which I completely forgot about, "gezundheit." I think they were raised with better manners and around more mannerly people than me. The same goes for the friend who said it was "danke" ("thank you"). My first word in German, to my best recollection, was "hasenpfeiffer." I recall hearing it again and again in a Bugs Bunny cartoon. Now you know something about my mispent youth. Among the words that I did not know was "plätzchen". It turns out that it means "cookie" in German. I think that would have been a far more appropriate word for me to know as a child than hasenpfeiffer as cookies were much more to my tastes at that time than rabbit stew. And, for what it's worth, the only other person besides me who knew a food word as their first one knew sauerkraut. That told me something about his early exposure to German food in a manner which made me feel bad for him. No, I'm not a fan of sour, wet cabbage that looks like it spent some time in someone's dirty sock. Let me apologize for not having an actual picture of these cookies. You can see them through the window of the bag, but that's substandard cookie-viewage. 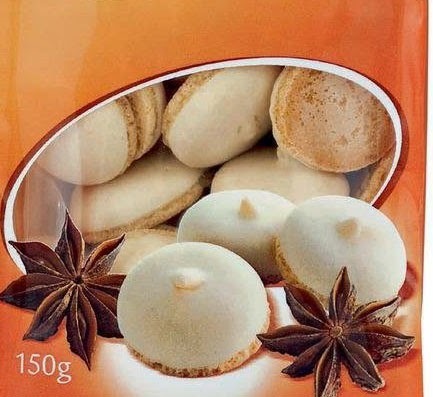 They do actually look the same as the illustration, though the actual cookies are quite tiny. Each is about the diameter of a nickel (or five-yen coin). This close up of the window of the bag is from Amazon Germany's picture - it's pretty clear and it makes me feel less bad about not having a proper picture. These are two layers and the top is an anise-flavored meringue dome with a crispy little cookie base that lends textural contrast, but very little in the way of flavor. Most of the flavor comes through in the little meringe top and it is lovely if you're a fan of anise. The combination of the meringue crunch and sweetness with the spice of the anise is a big winner in my book, but I'm a sucker for anything meringue. Some people find this type of cookie too hard and dry. I loved these. I really did. In fact, I'm definitely going to pick up another bag next time I'm at the little European shop in Palo Alto that carries them. 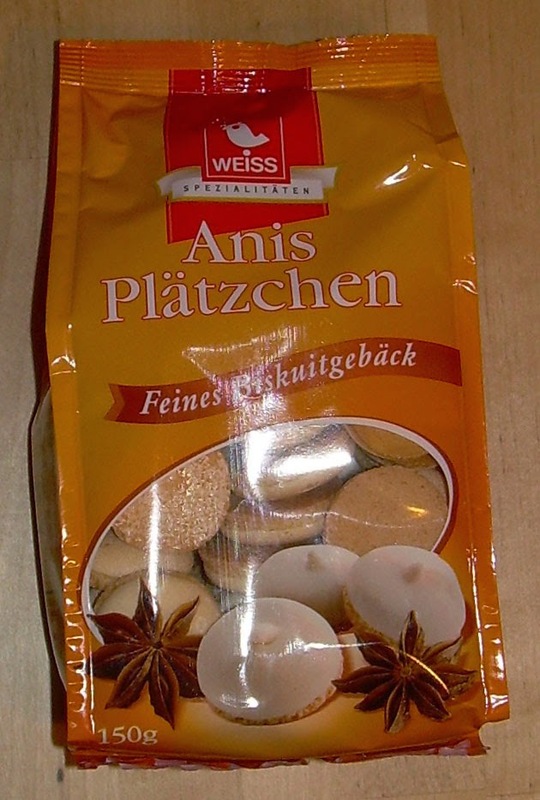 If you can get your hands on a bag, and you like anise, I can't recommend them highly enough.